In China where personnel expenses are rising remarkably, a serving robot for eating and drinking establishments is already active. Do you know that there are Chinese enterprises shipping more than 1,000 units of robots that do catering work at restaurants? Pangorin Robot (Kunshan Brewery instructor, headquarters is Kunshan City, Jiangsu Province) which provides catering robots to restaurants in more than 200 cities across China. It has over 20,000 robot production capacities per year. The company 's robot for restaurants is that it eliminates complicated functions and narrows down to necessary minimum functions. The appearance is a figure like a human figure, but the arm with the setting table on which the dish is placed is not movable but fixed. The cooking raise and lowering from this cooking stand is done not by the robot itself but by an employee of a restaurant, a visiting customer, etc. manually. The robot travels through a predetermined route in the restaurant and plays a role of conveying the dish to the side of the visitor's seat. In order to make it more friendly in the restaurant, it is an image like a humanoid face or hand attached to the transfer robot. 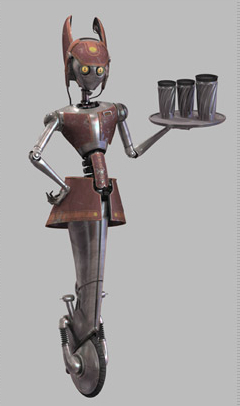 SF film fans are of course familiar with robot waiters; R2D2 served as a robotic waiter on Jabba's sailbarge, and the waitress WA-7 from Star Wars II Attack of the Clones.